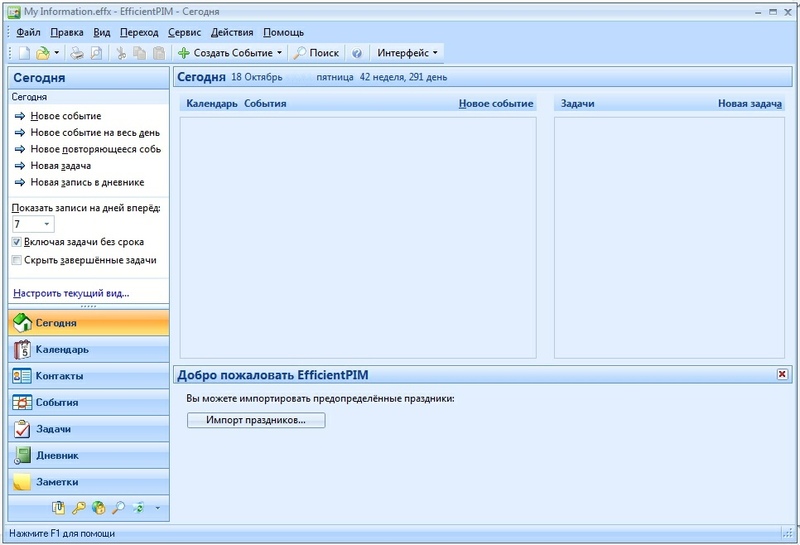 EfficientPIM Pro 5.50 Build 543 + Portable » Шумак Инфо - Есть всё. Фильмы. Сериалы. Программы, софт, музыка и книги. 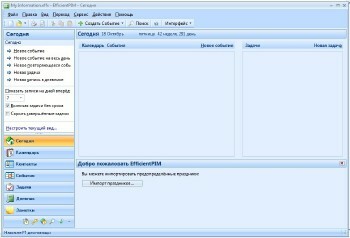 • EfficientPIM is a professional All-In-One PIM software program (Personal Information Manager). It can manage your contacts, appointments, tasks, diaries, notes, passwords, or any other information you need access to. • 8 interface styles are provided to meet your individual needs! They have various tones of color like blue, green or metallic, and have Vista standard and XP standard windows appearances separately. • As powerful as the software is, it is also easy to use! Finding your information will be quicker and easier than ever before. Consistent operation interfaces for different features in this software make it simple to operate. • EfficientPIM has powerful search capabilities so you can quickly find your information. • EfficientPIM has embedded a powerful document editor similar to MS-Word, which can be used to write your diary, memos, notes, remarks, and a variety of other documents. • You can browse information such as contacts and tasks in card view. • Reflecting a people-oriented management philosophy, in addition to recording the information of your contacts, you can also track the events, appointments, tasks and diary related to them to enhance your personal network. • EfficientPIM provides you with a powerful way to manage all of your passwords. The password manager can help you record and find all your passwords. From now on, you only need to remember one password! • You can "stick" information on the computer desktop directly! At a glance you can see the information that is important to you. • There is a Recycle Bin in this software, you do not need to be worried that you may delete some important information by mistake. The functions of Backup and Restore can help you conveniently save and migrate data. The software stores all sensitive information, such as passwords, in encrypted format. • New fields are added in Task module: Total Work, Actual Work, Mileage, Billing Information, Company. • New field of Completion Date is added to the editing window of Task. • New settings are added: total work hours per day, total work hours per week. • (Network version) New field of Creator is added to Record list. • (Network version) New field of Creator is added to Detail list. • Bug fixed: New changes may not be saved for some fields if you directly change in the record list. • Update language packages of English, Simplified Chinese, Traditional Chinese and so on. • Other improvements are made and bugs are fixed.